Peaches are a great summertime treat, given their peak season in the summer months with July and August producing the best crop. Similar to nectarines, peaches are a stone fruit that are moderate in size, with a juicy, sweet flesh. The main difference between the two is the skin. Peaches have a thin, fuzz-covered skin, while nectarines are smooth with no fuzz. The flesh ranges from white to pale orange and they can be interchanged in recipes. Peaches are separated into two categories: clingstone and freestone. Freestone peaches are commonly eaten out of hand because of their skin parts easily from the pit or stone. Clingstone peaches are better used for cooking and are the type that is used most commonly for canning. One medium peach has 14 grams of carbohydrates, 2.2 grams of fiber, and 13 grams of sugar. Peaches are a low-glycemic fruit, which means it will have a minimal effect on blood sugar. If you have diabetes, note that all people react to certain foods differently and therefore doing a simple blood sugar test can help you to determine how you respond to this fruit. Peaches' glycemic index is 28 and its glycemic load is 4. Peaches are a low-fat food with less than one-half gram of fat per serving. The small amount of fat in peaches are heart-healthy monounsaturated and polyunsaturated fats. Peaches aren't a rich source of protein, but one medium peach has 1.4 grams of protein. Peaches are rich in micronutrients including vitamin C, vitamin A, vitamin K, and B-complex vitamins like thiamin, niacin, and riboflavin. The fruit also contains 285 mg of potassium, which is 8 percent of your recommended daily needs. Peaches are rich in antioxidants, especially vitamin C. Antioxidants seek and destroy free radicals, which are the result of oxidation in the body and can lead to heart disease, stroke, cancer, and other chronic inflammatory diseases. Vitamin C is perhaps one of the most well-known antioxidants. In addition to having antioxidant benefits, vitamin C aids in boosting immunity, cell repair, including wound healing, as well as having anti-aging properties. Peaches are also a good source of fiber. Fiber is important for all people, as it helps to remove cholesterol out of the body, promotes bowel health, increases satiety and can help to stabilize blood sugars. A fiber-rich diet can help to prevent certain cancers and reduce the risk for diabetes, heart disease, and obesity. In addition, eating a diet rich in fiber can help to keep you full and promote weight loss. Peaches contain carotenoids, particularly, provitamin A carotenoids, α-carotene, β-carotene, which can be synthesized into vitamin A, which is essential for normal vision and immune health. In addition, animal studies have found compounds in peaches may help fight certain diseases, including breast cancer. In one study, procyanidins, anthocyanins, and quercetin in peach extracts were found to inhibit the growth of certain breast cancer cells. Another study found bioactive compounds in peaches (as well as plums and nectarines) may inhibit obesity-related diabetes and cardiovascular disease. Researchers believe the anthocyanins, chlorogenic acids, quercetin derivatives, and catechins from these fruits work synergistically to reduce LDL or "bad" cholesterol, obesity, and inflammation related to metabolic syndrome. These studies, however, were not performed in humans and should be taken with a grain of salt. What are peach preserves? Are they healthy? Peach preserves are like jam but have a more chunky texture. They are usually prepared with sugar and a gelatin-like carbohydrate called pectin, which is used to thicken jams and jellies. They contain a large amount of sugar in one serving and should be used sparingly. To reduce carbohydrate content, you can find no-sugar-added preserves, but this product will likely have sugar substitute as a sweetening ingredient. Peaches are in season during the summer, but many people enjoy peaches year round thanks to canned peaches. Peaches can be preserved in syrup or juice, which add to the fruit's sweetness and increases calories and carbohydrate. Some store brands can peaches in water, which does not add extra calories or carbohydrates to the fruit. Are dried peaches good for you? Peaches can also be preserved through dehydration. Dried peaches are a sweet on-the-go snack but keep in mind dehydrated fruit has more sugar, calories, and carbohydrates than fresh peaches. A 1-ounce serving of dried peaches contains just over 100 calories, 23 grams of carbs, and 16 grams of sugar. Peaches are great eaten as is or they can be added to smoothies, low-fat yogurt, cottage cheese, hot cereal, salsa, and other savory relishes. Use them to add flavor, sweetness, and color to salads. They can be sautéed, grilled, or stewed, or used for jams, chutneys, and preserves. When buying peaches, choose ones that smell sweet. They should have a creamy, yellow or yellow-orange color and unwrinkled skin. They should also yield slightly to pressure. If the skin is green, this means that the fruit was picked too early and it likely won't ripen—skip these. In addition, avoid peaches that have bruises or soft spots. If you buy your peaches somewhat firm you can place them on the counter to soften at room temperature for two to three days. To enhance ripening, place them in a paper bag with an apple. Refrigerate when they are ripe. Once refrigerated, they will not ripen any further. Do not wash peaches until they are ready to be used. You can also purchase peaches canned or frozen. Aim to buy canned peaches that do not contain added sugar and rinse them before use. Frozen peaches can be just as good if not better than fresh as they are harvested at peak freshness which maintains their nutrition and flavor. 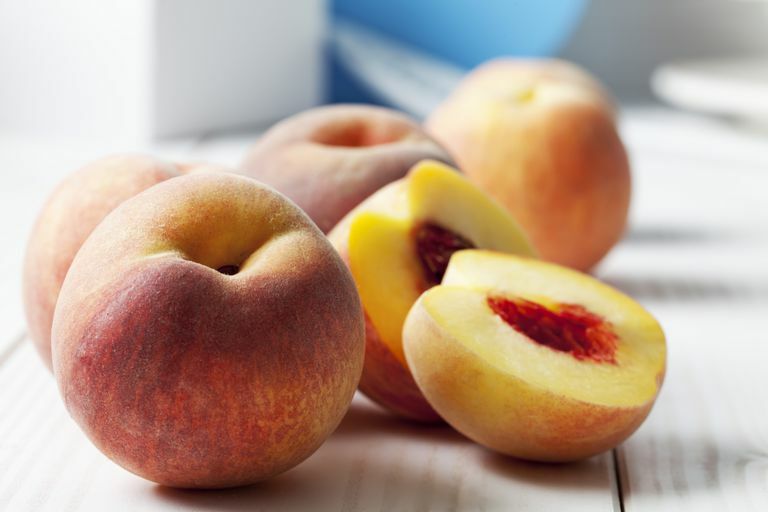 Some adults and children may be allergic to peaches, particularly people with birch-pollen allergies because the protein in birch-pollen is similar to the protein in peach. Common peach allergy symptoms include an itchy mouth or throat, or swelling of the lips, mouth, tongue, or throat. Noratto G, Porter W, Byrne D, Cisneros-Zevallos L. Identifying peach and plum polyphenols with chemopreventive potential against estrogen-independent breast cancer cells. J Agric Food Chem. 2009;57(12):5219-26. doi: 10.1021/jf900259m. Texas A&M AgriLife Communications. (2012, June 18). Peaches, plums, nectarines give obesity, diabetes slim chance. ScienceDaily.